On my first visit to the northern Spanish city of Bilbao some years ago I was a little apprehensive about what to expect from the city and its people. I was aware of the city’s industrial heritage, its famous football team and its apparent support for the Basque separatist movement but little else other than reports its growing tourism industry thanks largely to the locating of the Guggenheim Museum there. This Bilbao travel guide provides useful tourist information for visitors to this popular short-break destination. Arriving at Bilbao’s, Santiago Calatrava inspired, Sondika airport couldn’t have been more impressive and the 10km taxi ride to our city centre hotel along a modern highway seemed to take no time at all. First impressions were of a lively, modern city with impressive architecture, a wealth of historical sights and an abundance of attractive bars and restaurants. Any doubts about visiting this city were quickly dispelled as we wandered its charming streets and shared many glasses of wine with the lovely Basque people who made us feel so welcome. Interestingly when I enquired as to why they didn’t speak Basque they simply informed me that it’s because it’s too hard! Weather Forecast – When to Visit Bilbao? Located on the coast in the north of Spain the Bilbao climate tends to be quite wet with many rainy days. During the summer there is generally less rain than in winter and the daytime temperatures can reach 25ºC. Winter is colder but the temperatures seldom fall below 5ºC and there is almost never snow. Surrounded by wonderful lush, green, rolling hills Bilbao is a beautiful city to visit especially if you are lucky enough to get some good weather. Below is the Bilbao weather forecast for the next 4 days. Below that are two graphs showing the average monthly temperature and rainfall throughout the year. Bilbao Airport lies just 12km from the centre of Bilbao in the district of Loiu. Its main terminal is an architectural masterpiece designed by Santiago Calatrava. Today there are plenty direct international flights from a number of European cities including London, Manchester, Paris, Amsterdam, Frankfurt and Dusseldorf. There are also many domestic arrivals including flights from both Madrid and Barcelona. Vueling, the Catalan airline, has made Bilbao one of its key hubs. Together with the Guggenheim Museum and a fabulous underground system, the airport is another example of the modernisation which the Basque capital has experienced in the modern era. It is one of the city’s outstanding landmarks and the terminal can handle up to four million passengers a year. Bilbao City Breaks: Independent travellers will be able to find flights and book accommodation in Bilbao without any problem. However, if you’d prefer to book flights and hotel in one place take a look at Bilbao City Breaks at at easyJet Holidays where you’ll find some very good deals. Bus Services: The cheapest way to get into the city centre is by taking the airport bus which runs every 30 minutes from the airport to Gran Via, Plaza Moyua and Alameda Recalde in the centre. The bus stop is just to your right as you walk outside the arrivals area. If you’re returning to the airport the bus leaves Bilbao from the main bus station which is called ‘Termibus’ every 30 minutes. You can also pick it up outside the Carlton Hotel in Plaza Moyua. Taxis and Private Transfers: Often a more convenient option is to simply jump into one of the waiting taxis which meet all incoming flights. The journey into the city centre costs around €25 though this will vary according to exactly where you’re heading for and your arrival time. The taxi rank is immediately outside the arrivals area. Alternatively, you can book a private transfer and have a driver awaiting you on arrival. Bilbao is not only the gateway to the Basque Country, it is also the most convenient airport destination for visitors heading for San Sebastian, Pamplona and the Rioja wine region. The private transfer option is mentioned above is ideal for such longer transfers or you could pick up a hire car at Bilbao Airport and drive to your final destination. Getting around Bilbao is no problem thanks to its ultra modern transport system. It has a sparkling Metro system which is as clean, punctual and secure as any in the world and so easy to use. It also boasts a tram and light rail system, an extensive public bus network and a plethora of taxi ranks. However, given its size, the great thing about Bilbao is that everywhere is walkable. You can easily walk to any place of interest. If you need a break then stop at any of the hundreds of bars and cafes (does any city have more?). There you can enjoy some liquid refreshment and ‘pintxos’ which are local tapas. Bilbao Metro System: The Bilbao metro system has two lines and is very user friendly. The entrances are denoted by tall shining steel poles with a triple orange/red circle on the top. Most entrances also have a type of glasshouse tunnel leading into them, very stylistic and easy to see. These glass tunnels, designed by the architect Norman Foster, are affectionately referred to by the locals as ‘Fosteritos’ … Little Fosters. All metro stops are accessed by elevators and lifts. Tickets are purchased from the machines only which are in Spanish and English and are very easy to use. They always work, always give change and they take coins or notes. They are operated by touch screen. You purchase single or return tickets but if you think you will use it a few times then the ‘creditans’ (tickets for multi-use) are the best value. They come in 5, 10, 15 and 20 euros. Each time you use it the price is clocked up on the back so you always know how much credit you have left. The trains and stations are spotless and very safe. The arrival times and destinations are clearly shown on the platforms. There are usually two exits from each station, it’s useful if you know where you want to exit but in most cases the two exits are never very far from each other above ground anyway. Trains run from early morning until 11pm from Sunday to Thursday. On Fridays they run until 2am (plans are afoot to make it all night). On Saturdays they run for 24 hours. In peak hours the trains come every few minutes, and off peak you will never wait for more than 10 minutes and usually less. So Lines one and two will have Extebarri as their southern destination and Plentzia OR Sestao for the northern destination (see map below). If you are just travelling around the centre then you can take either line for all stops north or south. If you want to go to the beach then head off to Plentzia which is also a very nice village. Sopelana also has some lovely beaches. More within the city Areeta, Algorta and Gexto will also get you to the seaside. For more information see the Metro Bilbao Website. Construction of Line 3 is well developed and will eventually connect Etxebarri and Matiko. Bilbao Tram Network: To complement the fine metro system the EuskoTran tram service is another major addition to the city’s first class public transport system. Currently the system is only 4.4 km long with 12 stops between Basurto to Atxuri. You’ll see the trams running along the grass covered tracks as you walk along the riverside on your way to the Guggenheim. This is a good service for a sightseeing tour of Bilbao and on match days at San Mamés additional services are put on to transport fans to watch Athletic Bilbao football matches. For more information see the EuskoTren Website. Buses cover all the city in an extensive network. You can use your metro ticket on these too. Taxis are plentiful and reasonably priced. All the usual car hires are located in the airport. Bilbao is connected to most of the main train stations in Spain (www.renfe.es). For local journeys take the Eusko train from Axturi train station, serving Gernika, Bermeo, San Sebastian and other destinations. The main bus station is Termibus, exit from the San Mames metro stop. Buses for all national and international routes. 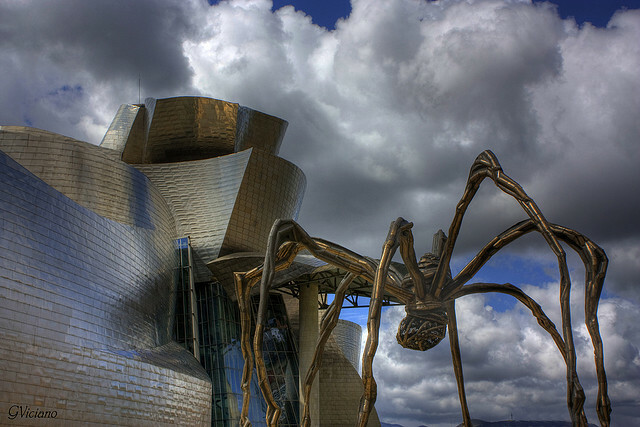 Most visitors will spend their time between the Guggenheim and the Casco Antiguo (Old City) just across the River Nervión, so I’ve recommended Bilbao hotels which are ideally located to provide access to these attractions on foot or by city tram. Facing the Guggenheim Museum, the Gran Hotel Domine Bilbao is a superb, ultra modern five-star hotel. Its 145 rooms offer maximum comfort with an interior decoration conceived to make guests walk through the history of design. Situated in the financial and business centre of the city, this hotel is one of the most emblematic buildings of Bilbao. Over the years it has welcomed many famous visitors including Ernest Hemingway, Orson Welles and most of Spain’s great bullfighters. The Silken Indautxu Hotel is located right in the very heart of Bilbao. Its guest rooms and suites are luxuriously furnished to create an elegant and comfortable atmosphere. The Barcelo Nervión Hotel is the largest hotel in the Basque Country. It has fine facilities and is situated in the city centre with easy access to the Guggenheim. Unfortunatley it can be a bit noisy at times. Located along the river from the Guggenheim with good access to the central commercial district and nearby public transport connecting to the Old City. If you’re visiting Bilbao or anywhere else in this beautiful area take a look at this selection of Hotels in Bilbao at Booking.com. 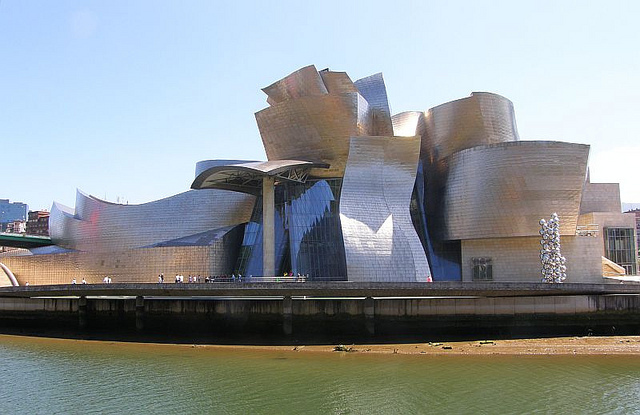 Once famous for its shipyards, Bilbao has experienced an incredible transformation thanks largely to the inspired decision to locate the magnificent Guggenheim museum there. Even if you’re not interested in the museum’s exhibitions you should visit the Guggenheim just to admire the shape and titanium structure of this amazing building which was designed by the North American architect Frank Gehry in the shape of a fish with scales. Sitting proudly on the banks of the River Nervión where the former shipyards once flourished, it is a clever reminder of Bilbao’s history as a port city. As you approach the main entrance look out for the huge sculpture called “Puppy” which has come to symbolise the city and is covered in thousands of fresh flowers. Whilst the Guggenheim and the ‘Museo de Bellas Artes’ are a must for art enthusiasts there’s a lot more to this earthy city than its inclusion on Spain’s prestigious art circuit. To really get a feel for the history and culture of the city you need to take a head into the old part of the city known as the ‘Casco Viejo’. Here you’ll discover the heart of the real Bilbao away from the art galleries where you can join the locals as they wander between tapas bars sampling an amazing selection of ‘pintxos’ as you go. Here you’ll stumble upon lovely buildings and ‘plazas’ with charming cafes where you can sit outdoors and watch the world go by, in fact, if you want to experience the ‘real Bilbao’ you really should try to stay in a hotel within walking distance of the old town. From the city it’s difficult to appreciate the beautiful setting of Bilbao which is surrounded by the rolling, green hills of the Basque Country to the south and the wild Bay of Biscay to the north. Take a short walk to the Artxanda funicular railway which climbs steeply to the top of a hill overlooking the city and gives you a panoramic view of the whole region. And finally, if you’re a football fan you should head out to Athletic Bilbao’s new San Mamés stadium which replaced its historic predecessor in 2013. In fact, if you’re in town when there’s a match on get yourself a ticket and experience what is one of the best atmospheres of any of the football grounds in Spain. Funicular Railway at Mount Artxanda: You have to take the Funicular Railway up to Mount Artxanda. Look for the Plaza Funicular marked 40 on the local tourist map. It’s on the hill side of the river opposite the Zubizurri pedestrian bridge and is a few streets up from the river. The train, operated by a pulley system, shoots up the vertical hillside, revealing stunning views as you rise above the city. It runs every 15 minutes and is very cheap. One way is enough as it is more fun to walk back down. At the top is a park which is a popular recreation area. You have stunning views down over the whole of Bilbao. It’s a great way to get your bearings as the whole city is laid out before you. You see how the river winds through the city and you can pick out all the landmark buildings. If you’ve been confused by the layout of Bilbao, you now have a much better idea of its shape. There are some fine walks at the top and plenty of restaurants to relax and eat traditional Basque cuisine. Walk back down through the verdant hillside either to Parque Extberri with its giant chimneystack or down to the Abando district. Don’t worry, just keep going downhill and you’ll come out somewhere in Bilbao. Lift in the Casco Viejo: Another thing to do is to take the lift in the Casco Viejo on Calle de la Esperanza, next to the sports centre behind La Iglesia de San Nicolás. You can’t miss it. It’s that giant concrete structure that rises up incongruously from the old town. When you alight at the top walk along the passageway and turn left into Park Extberri and enjoy the fine views of Bilbao and the greenery. Make your way round to the right and head up for the landmark Basilica de Begoña built in 1620. It has a lovely tree shaded courtyard to sit and relax in. Rather than taking the lift back down come down the side of the park down the hundreds of steps that take you into Plaza Unamundo in the Casco. If it’s evening time look out for the wall of sound that hits you rising up from the Casco. It’s simply the sound of people talking and going about their business, but they look like lots of little ants scurrying around the streets of the old town. Visit the Hanging Bridge: You also have to go and see the Hanging Bridge which connects Portugalete to Getxo. You can either take the train from Aband or San Mames to Portugalete or you may opt for the other side of the river by taking the metro to Areeta. The bridge is an awe inspiring site. It really is as remarkable a piece of engineering as you will find anywhere. It has got a giant Eiffel tower like frame that spans both sides of the river. A small ferry for cars and people hangs from it by cables. You get on and are carried suspended over the river as the cables slide along to the other side. It’s entertaining and a little surreal just to watch! It was opened in 1893 and is the oldest of its type in the world. In fact only a handful of these type of bridges were ever built. It operates 24 hours a day every day of the year. If you’ve got a good head for heights you can take the lift to the top and walk across the upper gangway and take the lift down again at the other side. The views are striking but you are 50 metres above the river so don’t suffer from dizziness. Museo de Bellas Artes (Museo Plaza, 2): Bilbao’s Fine Arts Museum is high on Spain’s list of main art galleries. Its chief exhibits include works by Spanish masters Velázquez, Zurbarán and (Greek born) El Greco. There is a modern section including works by Picasso and Sorolla as well as many works by Basque artists of the last century. Museo Vasco (Plaza Miguel de Unamuno, 4): This museum in the centre of the old city is dedicated to the Basque country and provides an insight into the history of this fascinating land. 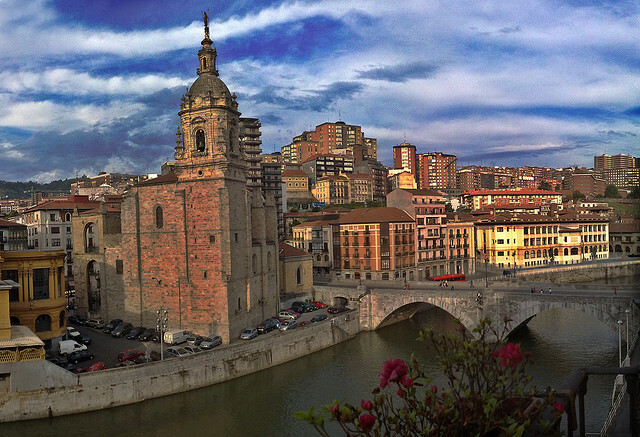 There are a number of short excursions from Bilbao which are well worthwhile if time permits. Bermeo: This traditional Basque fishing port throbs with life at the weekend and you will hear the native Basque language being spoken. Mundaka: A pretty seaside village and world famous for its excellent surfing. Guernica (Gernika in Basque): For centuries Guernica was the meeting place of the Basque assembly which met under an oak tree symbolising the freedom of the Basque people. Today it is remembered for the horrific events of April 26 1937 during the Spanish Civil War when the town was destroyed by Nazi bombings which inspired Picasso’s most famous painting. The town’s Peace Museum displays the horrific events of that fateful day. Durango: Durango suffered a similarly atrocious attack to Guernica but didn’t receive the same amount of media coverage at the time and Picasso never painted a picture of it so it never became so famous. A nice town with a medieval centre near to the stunning national park of Urkiola with its majestic mountains and wonderful vistas. San Sebastian: A city of grand elegance and charm with its beautiful beaches. You should consider staying in San Sebastian as a mere day excursion really doesn’t do it justice. Vitoria: The capital of the Basque Country with a wonderful medieval part. It is very green, has lots of parks and was voted the best city of its size for quality of lifestyle in Europe!